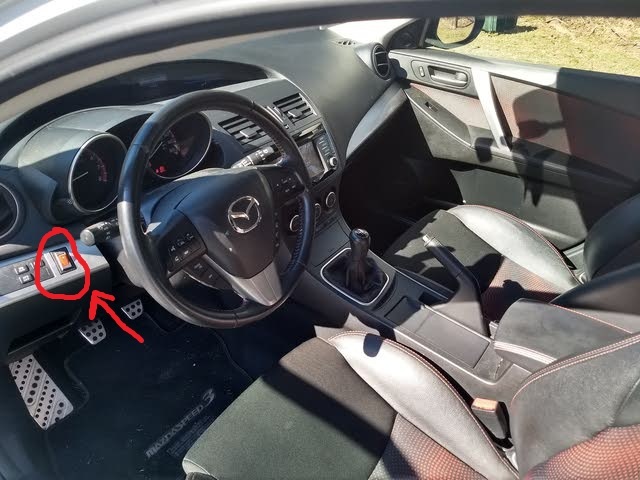 I scoping out a 2013 ms3 and noticed what appears to be an orange switch in one of the pictures. It doesn't look stock and I haven't seen it in any other cars. Usually the spot is vacant. So anyone know what it is or what aftermarket stuff that spot is commonly used for? Time to trace some wires. Underglow? Rocket Launcher? Light Bar? General Lee Horn? monkey.bones.007 and danb like this. I put a switch to disable the SWAS in that location. @deuce_WI; or rocket launcher as noted from before..
no one could tell you exactly what it is cause it's not a kit, and none of us built that car. but if i had to guess... it's a swas disable, or if you're lucky its an electric cutout. It's clearly a ZZB immunity switch. I'm going to check out the car tomorrow and the guy told me that there were "no mods". So either it's something innocuous or he's gonna put his arms up and say "Always been there, doesn't seem to do anything". It does something. My comment stands until proven otherwise. Engine runs, so by some strange association, it's for ZZB prevention. When you go to check it out, if you start it up and have no lights on the dash then flip that switch and the power steering and DSC lights come on its a SWAS disable. Well it aint the smoke screen...that button is under the throttle pedal.